Mid90s (film, 2018). A 2018 American coming-of-age comedy-drama film with "R" rating by A24. Directed by Jonah Hill. Official Trailer. 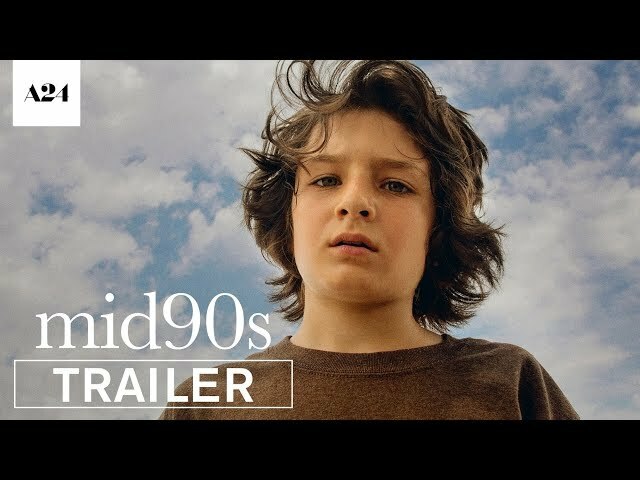 Mid90s is a 2018 American coming-of-age comedy-drama film directed by Jonah Hill. 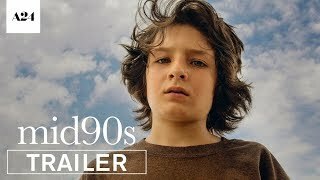 Mid90s | Official Trailer HD | A24. In the mid-1990s, 13-year-old Stevie lives in Los Angeles with his aggressive, fitness-obsessed older brother Ian and single mother Dabney. One day Stevie bikes past Motor Avenue Skateshop, admires the boastful camaraderie of skateboarders outside the shop, and returns the following day. Back home, Stevie trades with his brother for a skateboard, brings it to the shop and befriends young skater Ruben, who introduces him to the rest of the group: Ray, "Fuckshit," and "Fourth Grade." Although an inexperienced skater, Stevie is drawn to the group and aspires to imitate their daredevil behavior and anti-social attitudes. The group nicknames him "Sunburn" during a conversation. Ruben begins to resent Stevie because he feels he is being replaced as the "younger kid" in the group. While attempting a skateboard leap across an open section between two rooftops, Stevie falls and suffers a head injury. Dabney becomes concerned about Stevie's turn towards recklessness and his new friends, but Stevie has already made up his mind that he is sticking with the group. Ian has a tense standoff with Fuckshit as Stevie watches, but Ian appears intimidated by the group and leaves before a fight can break out. Stevie begins smoking, drinking, and experimenting with marijuana. At a party, he has his first sexual experience. After Stevie comes home intoxicated, he and Ian have a violent fight, after which Ian has an emotional breakdown (after Stevie says that he has no friends) and following the conflict a fed-up suicidal Stevie attempts to asphyxiate himself with a cord from a Super Nintendo controller. Alarmed by this turn of events, Dabney forbids Stevie from hanging out with the boys, but Stevie screams and curses at his mother, refusing to obey. Having alienated his mother and brother, Stevie sits alone behind the skate shop. Ray consoles Stevie, telling him that even though he thinks his life is bad, the other boys have it worse. Fourth Grade is poor to the point of not being able to afford socks; Ruben's mom is an abusive drug addict; Fuckshit's relentless partying with drugs and alcohol are worsening; and Ray lost his younger brother, who was hit by a car. Ray then takes Stevie out to skate at night, after which they fall asleep in a park. The film Mid90s was scheduled to be released by A24 on September 9, 2018 (TIFF) and on October 19, 2018 (United States). The duration of the film is 85 minutes. The film grossed over $7.4 million. Mid90s got high rating from critics. The audience also likes the film.